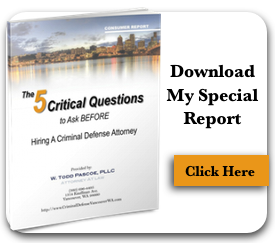 DUI law is complex in Washington State. It can and has changed. It’s important to know the legal landscape when you’ve been charged with a DUI and an attorney can help, because some of the penalties can be severe. Washington State has some of the strictest DUI laws and penalties, and earlier this year, some changes were made to the existing law. A piece in the Kent Reporter, “Important changes to the Washington state DUI laws” by attorneys Mark W. Prothero and Gregory L. Girard outlined some of the changes. Some of the changes are part of “Hailey’s Law” which was created by the state legislature. The law is named after Hailey French who in 2007 was seriously hurt in a head-on crash by a woman who had been arrested earlier for DUI but was quickly released. She got back in her car and then caused the accident. “Hailey’s Law” made changes. “The law requires the mandatory impound and hold of a vehicle when the driver is arrested for DUI or physical control. Upon impound, the car may not be redeemed by the driver for 12 hours. A registered owner who was not the arrested driver may redeem the vehicle at any time after impound. Previously, police officers had discretion in choosing whether to impound a vehicle or not,” the attorneys explain in their piece. Other things that changed include the ignition interlock device. “Drivers accused of DUI will be given day-for-day credit for use of an IID on vehicles they drive beginning from the date of the incident, including when an IID is ordered as a condition of pretrial release. The time the driver has the IID installed will be credited toward the mandatory use of an IID that will follow a DUI conviction, which could be for a minimum of one year, and up to ten years depending on the driver’s history,” the piece further explains. If you need an attorney following a DUI arrest, we can help.